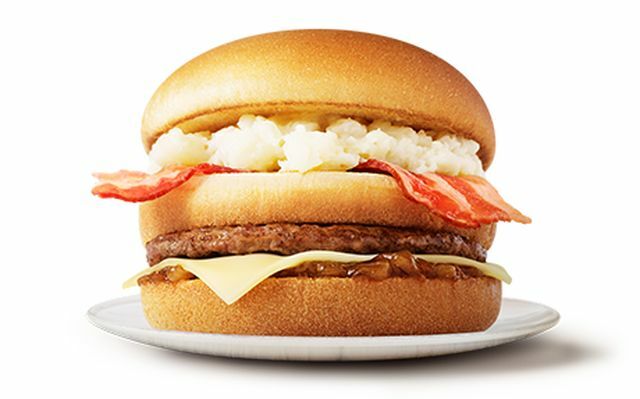 McDonald's Japan's latest is a Big Mac-style burger with mashed potatoes and bacon in place of one of the beef patties. Interestingly, they're calling on fans to name the burger. The rather meat-sparse burger includes mashed potatoes and strips of bacon between the top ("crown") and middle bun and a beef patty, grilled onion sauce, and cheddar cheese between the middle and bottom ("heel") buns. The price on the "Name Wanted" burger is 390 yen (~$3.42 US) and the winning name is set to be announced on February 22, 2016. There's a cash prize of about $12,500 in it for the winner, which was calculated as the price of the burger every day for 10 years.